The twinkling, flashing lights and booming sounds of fireworks as they illuminate the night sky are an enjoyable summer highlight for many of us. But given our pets’ keen hearing and sense of smell, fireworks are likely an intense experience of unpredictable thunderous noises, flaring lights and strong smells capable of triggering anxiety and fear. If fireworks scare your pet, consider these simple tips to help your four-legged family member feel safe and secure. Loud noises, unfamiliar places and crowds can be scary for some pets. To avoid spooking and possibly losing your furry family members, consider leaving them at home. Make sure your pet has a safe, escape-proof room, closet or crate to go to for relaxing and hiding away. Add some old clothes you’ve worn, a favorite toy or a food puzzle filled with tasty treats, and your pet may stay distracted and calm. Be sure to close windows and curtains to dampen sounds and block flashing lights of fireworks. Turning on the TV or playing soothing music may further drown out the noise of fireworks. Just be sure to keep the volume at a normal level to avoid increasing your pets’ anxiety. If you’re interested in trying soothing music to help your anxious pets, you may want to look into music that’s been formulated to calm pets, such as Through a Dog’s Ear or Through a Cat’s Ear. You’ll find plenty of information and even some music samples on the company’s website. Some pets become so terrified during fireworks that they destroy kennels, walls, windows and doors in their effort to escape the noise. Make sure your dogs and cats are wearing properly fitted collars with identification tags. Better yet, have your pets microchipped and be sure to keep your information current with the microchip registration company. Lit fireworks pose a danger to curious pets and can cause severe burns or trauma to your dogs’ or cats’ face and paws. But unused fireworks can be hazardous, too. Some fireworks contain potentially dangerous chemicals such as arsenic, potassium nitrate and other heavy metals that can cause vomiting, a painful abdomen, bloody diarrhea, even seizures and kidney or liver failure if eaten. 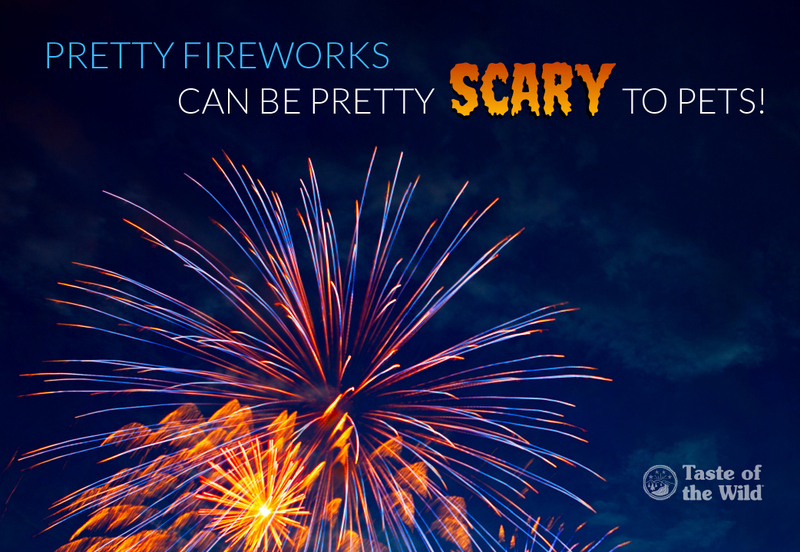 That’s why you’ll want to keep your furry friends away from both lit and unused fireworks. If your pets ingest any fireworks, immediately contact your veterinarian, the nearest emergency veterinarian, Pet Poison Helpline (1-800-213-6680) or ASPCA Animal Poison Control Center (1-888-426-4435) for medical advice. Don’t forget to clear your yard of fireworks debris before allowing pets outside. Even if you didn’t set off fireworks, debris may still be found in your yard, where curious dogs or cats may pick it up to play with or eat. One of the best ways to prepare your pets for fireworks is to acclimate them to the sounds in advance. Unfortunately, the desensitization process can take time — possibly three to four months — during which recorded sounds of fireworks or thunderstorms are played at increasingly louder volumes. You’ll want to create a positive experience for your pets during these listening sessions by giving treats, playing a fun game and plenty of petting so the noise is associated with something good or fun. For severe cases of fireworks phobia or anxiety, talk with your pet’s veterinarian. In addition to behavior modification, your veterinarian may recommend calming treats, compression garments such as the ThunderShirt or medication. Or your veterinarian may refer you to a board-certified veterinary behaviorist who is skilled in handling these kinds of conditions. Your four-legged family members don’t need to suffer through their fear of fireworks. With some advanced planning, a cozy hiding place and favorite distractions, you can help your pets stay and feel safe.